A guide to drawing Manga-style comic book art. As Manga style stresses character rather than anatomy, Manga comics are easier to draw. This manual explains how to draw fantasy robots, diabolical monsters, mythical animals and other characters that are part of this Japanese genre. 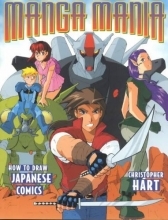 The author covers both the young and more mature styles of Manga art and includes artwork from some of the top-rated Manga artists working in this field.